Overhead obstacles are everywhere it seems in the basement world! I call this overhead basement finishing area the”Ceilingscape”…that’s my word…I own it…lol! Most of the time these eyesores are exactly where you don’t what them or need them to be located. But the good news is, all of these obstacles overhead can be hidden and made to look awesome if you understand and use just a few basic basement framing “tricks of the trade”. One such obstacle is the stand-alone support beam. This is a beam that is out in the middle of the future finished ceiling space that sort of messes up your plans for a nice flat level ceiling…this beam is usually 8′-0″ to 12′-0″ long and is usually just sitting all by it’self with no other obstacles beside or around it. This beam is usually not the main support beam in the basement either, rather a beam in an out of the way area of the basement such as at the beginning of a basement foundation outcropping. This beam will need to be hidden inside a small containment environment called a “soffit”. A soffit is a quick and easy way to hide almost any larger overhead obstacles that you will encounter during your basement framing project. Duct-work, pipes, wires, and beams are the most common obstacles that are hidden inside soffits. 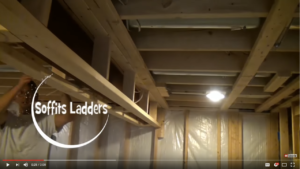 I have for you here an example video that shows you how two different stand-alone support beams were hidden inside 2″ x 4″ framed soffits. By using the soffit framing technique you will be able to hide any overhead beam while at the same time achieving awesome professional finished ceiling results! Good luck with your basement ceiling framing projects! WATCH THIS VIDEO TO LEARN MORE ABOUT HIDING BEAMS!